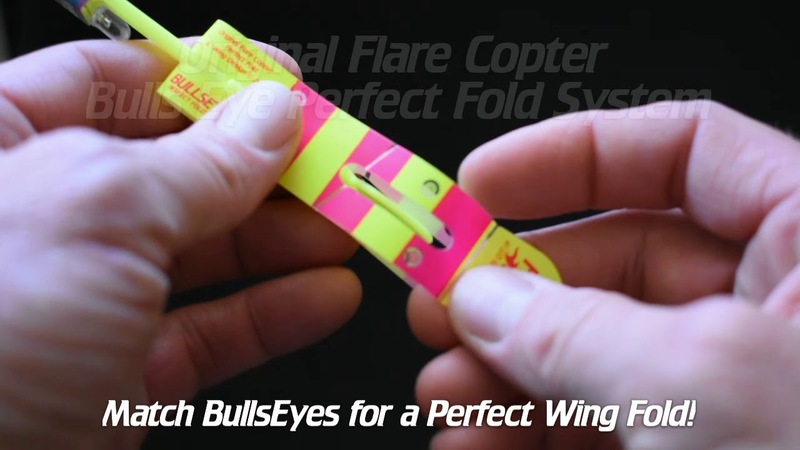 We have now Engineered a New Improved fold combination in the BULLSEYE PERFECT FOLD SYSTEM that creates more stability and takes the guess work out of folding the wings! Hours of R&D resulted in creating a very slight angle at the top while easing the angle on the bottom and created more stability and longer float times! We have the ONLY TRANSPARENT FOLD LINES and our Bullseye Perfect Fold System, also transparent, is helping Vendors around the world make Perfect Folds and the longest float times making it EASIER TO SELL and MAKE MORE MONEY!!! Our unique material design and newly developed injection mold system for more stability and strength creates a NEW light and aerodynamic body that soars higher than any other copter. We use the highest grade ECO Friendly plastic in our wing design. Our “MO” has always been to provide the highest quality and Best Led Copter on the market. Flare Copters are Made of the Highest Grade Materials and can reach heights of over 150ft. Other companies claim to fly higher, like 250ft, but through good R&D and hundreds of vendors around the world reporting, we are proud to say our product reaches upwards of 200+ feet in the best conditions. We pride ourselves on staying at the Edge of Evolution for the Best LED Slingshot Copter. Vendors of our are positive that we have the Highest Flying of led copters. You can be a Vendor of the best led copter today. Check out Flare Copter’s New Wing Designs that produce an unmatched Glow in the Night Sky! No Other LED Copter is Brighter in the Sky!